Sometimes a board just speaks to you. You look at its lines and the way it’s put together and you think, “Yeah, I could ride that.” This Arbor Pocket Rocket Cruiser review is about one of those boards. It may or may not suit your tastes or style, but it is hard to argue with quality. 2 What’s NOT to like? 3 Is Small Longboard an Oxymoron? 4 Pocket Rocket Is For Cruisers! 5 Can You Trust Arbor? 6 Is it the right board for you? The Pocket Rocket is a nimble little mini cruiser that lends itself to tight spaces. Its beautiful top layer (regardless of model) will lead to lots of oohs and ah’s from other people, and Arbor utilizes top-shelf trucks and wheels to sweeten the deal. It is solidly built in a craftsman’s tradition, making buyer’s remorse unlikely in the looks department. And its environmentally conscious construction reduces its (and your) carbon footprint. One of the chief complaints of Pocket Rocket riders is the board’s inherent lack of flex. While this may be less of a drawback for some beginning skaters who are not yet comfortable with digging into turns, the board’s stiffness is still problematic when it comes to aggressive carving. Also, premium materials usually command premium prices, and the Pocket Rocket is no exception. And, maintaining the green theme, Arbor chose to use Lucid Grip’s clear, spray-on grip product, which is composed of recycled crushed glass. While it definitely shows off the grain in the top layer, the adhesive product seems to wear easier than grip tape and will require sanding and replacement at some point in the board’s life. Is Small Longboard an Oxymoron? The Pocket Rocket comes in at 7.75 inches wide and 26 inches long with a 26-inch wheelbase. In all dimensions, this is short for a longboard. It has modest concave and a slight rise to its smallish tail and nose. The suspension comes in the form of 108mm Street trucks by Paris Truck Co. These are a vertical, standard kingpin type, as opposed to a reverse kingpin. The Pocket Rocket includes 1/4-inch risers, made from recycled plastic, to keep the board from rubbing the wheels (wheel bite). The trucks have a high rise, so smaller wheels would make the risers unnecessary. The wheels are Arbor Sucrose Initiative, Bogart Series offset wheels, in 78a durometer and 61mm diameter, with a 36mm contact patch. The Sucrose Initiative wheels all feature the inclusion of, you guessed it, sugars in the urethane formula. The Pocket Rocket uses Arbor’s Fusion Formula, which is intended for everyday riding, in line with the Pocket Rocket’s cruiser styling. Also, they’re one of our TOP recommended wheels. Pocket Rocket Is For Cruisers! The Pocket Rocket is really an all-around tool. It is meant to be nimble, and its small size makes it portable. If you find yourself skating through crowds often, then the Pocket Rocket’s size may help you maneuver around pedestrians and obstacles. Arbor selected the soft urethane in the wheels specifically to help negotiate the rough and often cracked concrete that city streets are known for. But the Pocket Rocket can do more than just cruise around. If you’re more experienced or adventurous, the soft Bogart wheels will let go and slide if pushed, and will handle higher speeds well. The Paris Street trucks are a solid choice for a street cruiser, able to hold steady at speed but still riding smoothly into carves. Check out this Arbor promo video for 360-degree views of the Pocket Rocket and some street slashing action to get an idea of what the Pocket Rocket can do. The Arbor story begins in 1995 when Chris Jensen and Bob Carlson began making snowboards. While working in Venice Beach, California to hone their snowboard crafting skills, the occasional blemish would rear its head. It was these imperfect snowboards that Jensen and Carlson would shape into Arbor’s first skateboard decks in 1996. That same year, Carlson and Jensen launched their snowboard brand. Arbor produces high-quality skateboards and snowboards, with an emphasis on artistry and craftsmanship. 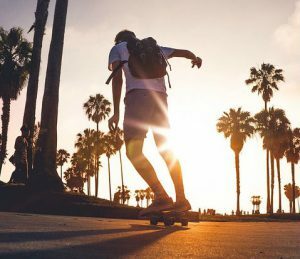 The attention to detail that is the hallmark of an Arbor longboard is apparent with just one look at the woodgrain in their board tops, and it should be no surprise that these premium skateboards command premium prices. The guys at Arbor aim to produce environmentally sound skateboards (same goes for their snowboards). They incorporate natural, sustainable materials into their products and find ways to reduce the effect their equipment has on the environment. This is a novel approach to skateboard production and one that I find difficult to fault. 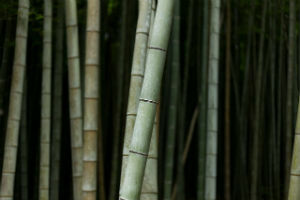 Another Arbor innovation, introduced to the public in 2005, is the bamboo-top deck. Bamboo is a much more sustainable material even than wood, which itself is considered renewable, and the Pocket Rocket Bamboo is an option if the added flex of bamboo appeals to you. For more info on Arbor’s competition check our recommended longboard brands list. Is it the right board for you? Well, it is an excellent choice for anyone looking for a quality cruiser that will do many things well. It is everything it professes to be. The quality build is evident and striking, and the components are all perfectly suited for its intended uses. If its small size puts you off, you probably aren’t really looking for a mini cruiser. And its green aspects should only be a turnoff for the most jaded of people. When the grip goop wears out, you can replace it with the same product, or switch to conventional grip tape (I’d keep it clear, because pretty). In the end, what you get is a hybrid, a street-skateboard-sized longboard that can maneuver well for aggressive street riding, and a compact cruiser that would work for commuting and laid-back cruising. And one that looks good just chilling in the corner.